These Coconut Macaroons Were Good, But I'm Still Searching For Better! This was a new recipe for me this Christmas. I had a coconut macaroon recipe in my files that I really liked but I lost it. It was before the days of my blog. I really like using unsweetened minimally processed coconut, which poses some problems. 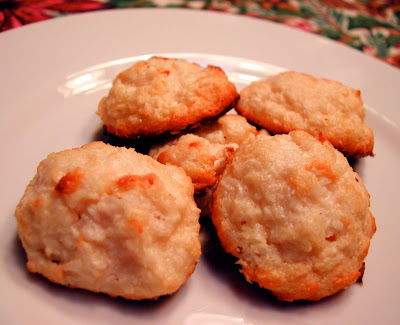 First, there are not a lot of good recipes for coconut macaroons using unsweetened coconut. Secondly, if you don't have the correct measurements or just the right ingredients, they always come out dry and tasteless. Just plain bad! So you ask, why bother with unsweetened coconut? And I say because it's my thing. You know, "healthier cooking". Minimal "processed" ingredients. Lower fat alternatives that still taste great. So if you have that perfect recipe let me know. Thanks for listening (hehe)! In the meanwhile you can try this one. It's pretty good, just not perfect! In a large bowl combine the coconut, condensed milk, and vanilla. In the bowl of an electric mixer fitted with the whisk attachment, whip the egg whites and salt on high speed until they form medium-firm peaks. To the coconut mixture, carefully fold in the egg whites. Drop cookies onto parchment lined cookie sheets, using either a 1 3/4-inch diameter ice cream scoop, or 2 teaspoons. Bake for 15 to 20 minutes, until golden brown. Let cool, serve or store in an airtight container. You know what? I never thought to use the flaked coconut that wasn't sweetened. I just found it in the store, recently...but it had been there the whole time. I'm going to use the natural kind from now on. It probably tastes more "coconutty" anyway. I'll keep my eyes out for a good recipe for you.